NEW YORK (WABC) -- The tourist whose foot was amputated after he stepped on an explosive inside New York City's Central Park earlier this summer marked a major milestone in his recovery -- he took his first steps. Connor Golden, 18, of Fairfax, Virginia, posted an update on his fundraising website Monday, the first public message from the teen since the July 3 incident near 62nd Street and Fifth Avenue. He said he walked for the first time since getting a prosthetic leg, and has since returned to class at the University of Miami. I cannot find words that adequately express my gratitude for how much hope and support you all have given me. It is a beautiful thing to see how many people are by my side when a tragedy like this strikes. Friends, family, and compassionate people I have never met - including fellow amputees, New Yorkers, fellow students and alumni, and those having a shared interest in music or scouting - have decided to help. I want everyone to know how much your support means to me. 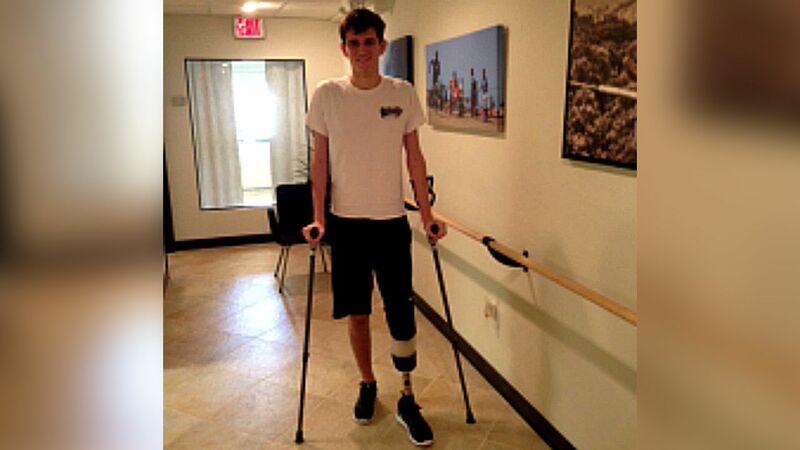 This past week, I returned to school and took my first steps on a prosthetic leg, which all of you have helped me pay for (in addition to other medical bills and recovery expenses). I am posting with this note a photo of me at the prosthetist's office on the day I received the prosthetic leg. You'll see that I'm smiling in the photo. That's not just because I'm happy to begin walking again. It's also because I am so grateful for the huge amount of love and caring that has taken me from the shock of July 3 in Central Park, through the very difficult operations at Bellevue hospital, through police questioning and media pressure, through the healing process while at my parents' house in Northern Virginia, through my trip back to school while on a wheelchair and crutches, to standing on my new leg. The fundraiser site that friends of the family started has raised nearly $75,000 to help with medical bills and other costs related to the ordeal. Golden suffered setbacks in his recovery, suffering complications from an infection that prolonged his stay in NYC. Law enforcement sources said the NYPD believes the device was nothing more than a prank or the work of a hobbyist. They said investigators believe the creator attempted to make a homemade type explosive and discarded it when it failed to detonate, only to be discovered by the victim. Though, the sources did confirm to Eyewitness News that the preliminary analysis showed trace elements of TATP, which is short for triacetone triperoxide -- a very highly explosive material.